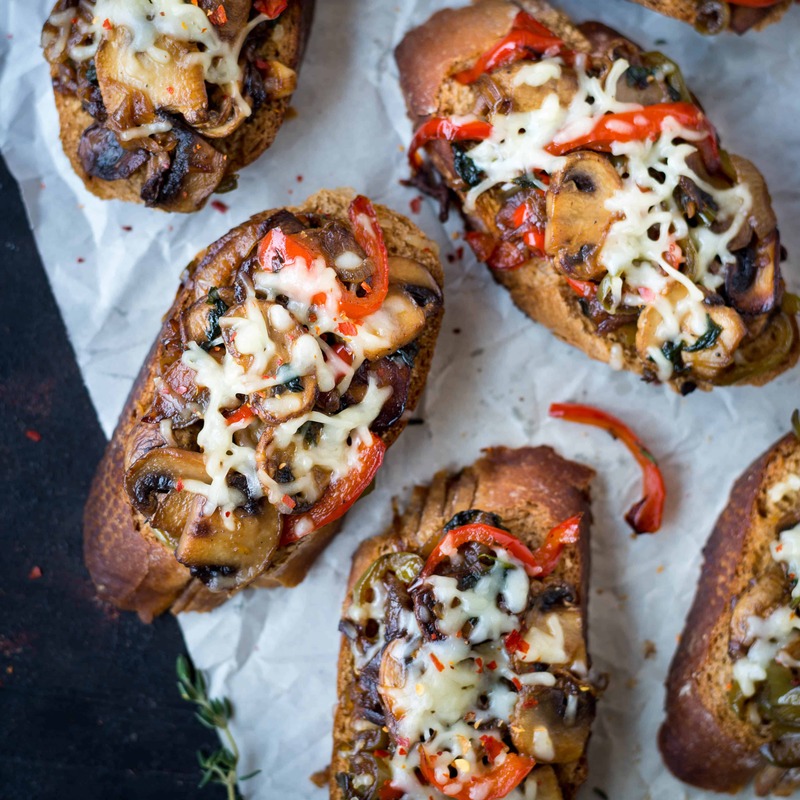 Caramelized Onion and Mushroom Bruschetta is a perfect breakfast or an appetizer. 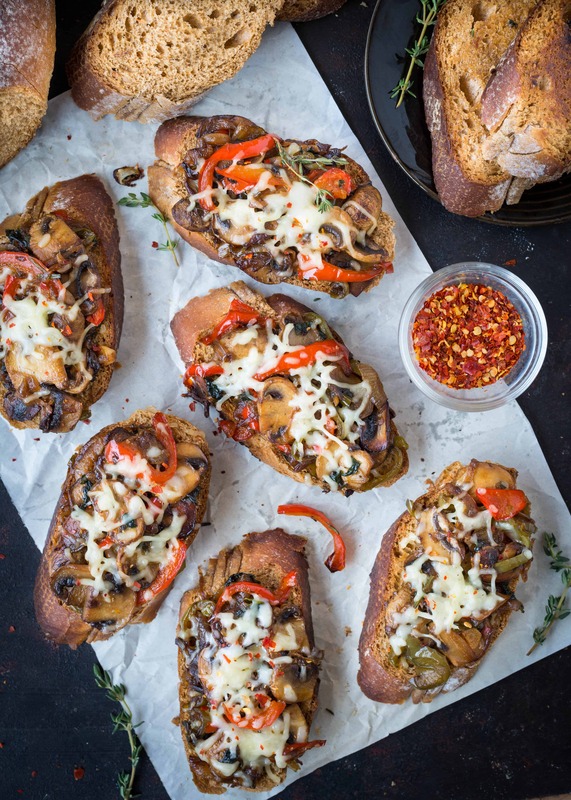 Chewy crusty bread topped with caramelized Onion ,Mushroom ,bell pepper and is loaded with flavors. 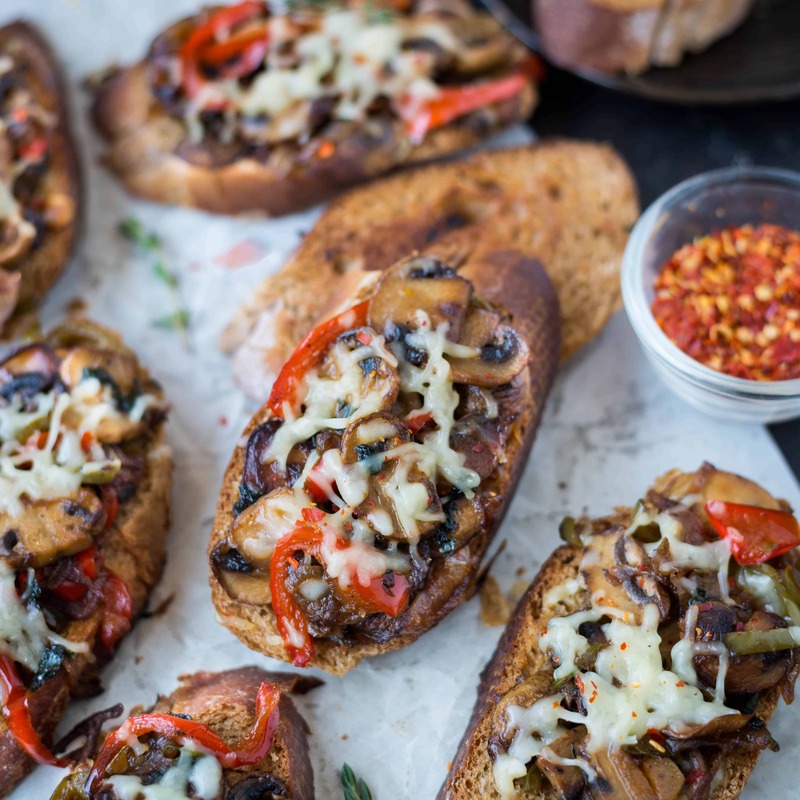 The caramelized topping has a hint of sweetness and one of the best savory topping for bruschetta. Sandwich is a regular thing on our breakfast menu. You just have to be creative with the topping. 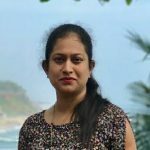 The most common stuffing is Onion,cucumber,tomato,boiled mashed potato topped with lots of cheese and the breads are slathered in Coriander mint chutney. Another favorite is a simple egg bhurji (Indian Scrambled egg) sandwich. These are the two quick sandwich for a busy weekday morning. I usually make this sandwich on a weekend or on weekday for dinner along side some soup/stew. You really need to be patient while caramelizing the onions. A little underdone or burnt onions would spoil the enter dish. And believe me the light sweet note of caramelized onion is just mind fantastic. Instead of bruschetta you can also make sandwich with the stuffing. 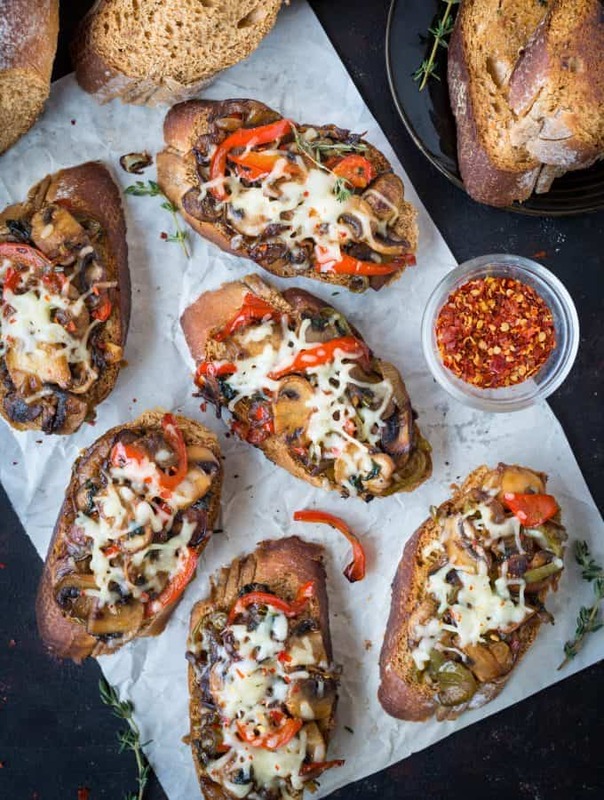 Chewy crusty bread topped with caramelized Onion ,Mushroom ,bell pepper and is loaded with flavors. The caramelized topping has a hint of sweetness and one of the best savory topping for bruschetta. 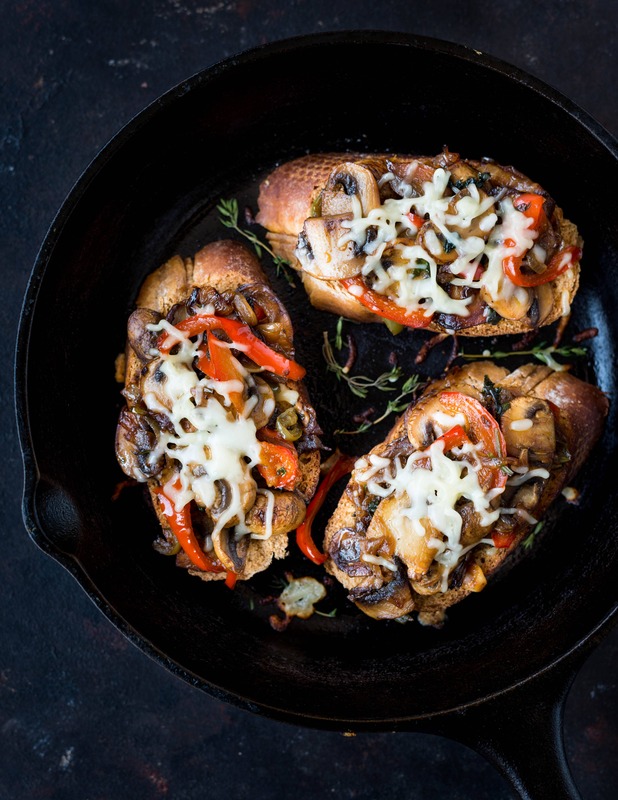 Add Mushroom slices to a pan. Cook on medium-high heat till all the water released by the mushrooms are dried and mushrooms are caramelized on both the sides. Remove from pan and keep aside. Add oil and butter to the same pan. Once hot add thinly sliced onion. Sprinkle little salt over the onion. Fry onions on medium-high heat till they are soften and looks transparent. Then reduce heat and cook till onions are light brown in color and nicely caramelized. Add thinly sliced peppers, caramelized mushroom to the pan. Add chopped green chili(if using) , thyme, chopped coriander leaves, salt and pepper. Mix everything well and cook further for 4-5 minutes on low heat. Spread butter on both the sides of bread slice. If using oven to toast - Preheat oven in Broil/grill mode at 200 degree Celsius. Once pre heated toast bread slices turning in between, till golden brown in color. Then top each slice with onion mushroom topping. Sprinkle shredded cheese on top and grill/broil for another 1 minutes / until the cheese melts. If using a pan : Heat the pan (preferably cast iron pan). Toast the bread on both sides till its light brown in color and crisp on the edges. Reduce heat. Top each slice with the stuffing and sprinkle cheese on top. Close the pan using a lid and let it cook on low heat until the cheese melts.